Jane Magon has designed this simple, elegant necklace using a razorback boar tusk set with lapis lazuli, sapphire, worked in sterling silver and 9 carat yellow gold trim set with high quality lapis lazuli cabochon and lovely lively blue sapphire. 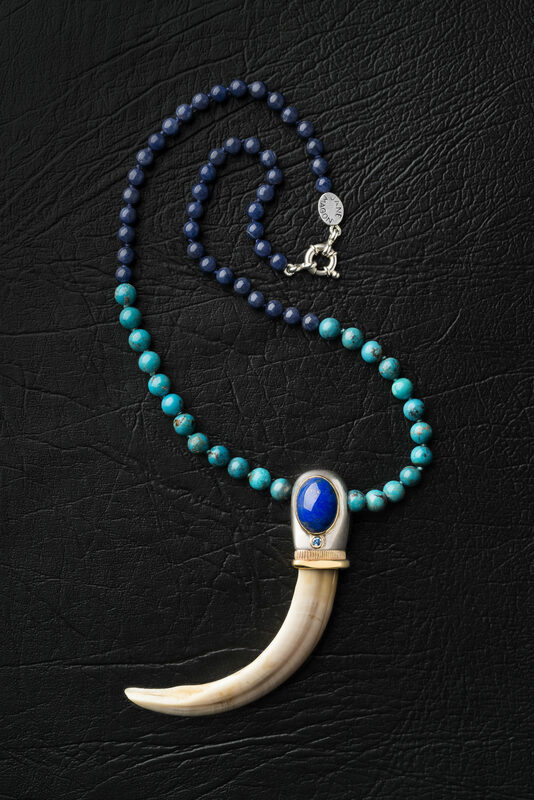 The tusk and setting is knotted on to turquoise & sodalite beads. The pendant is completed with a silver bold ring clasp. In New Guinea the warrior’s boar tusk is inserted through the nasal septum. The memory is a strong design inspiration for some of my work. ‘Boar tusks are worn by the men especially in the Highlands of Papua New Guinea. Different arrangements or designs may indicate social origin and status, including pearl shell and crocodile teeth on the coast. How many pigs one owned, indicated one’s wealth. Many pigs were feral and dangerous. The full story will be the exclusive privilege of the owner of this piece.